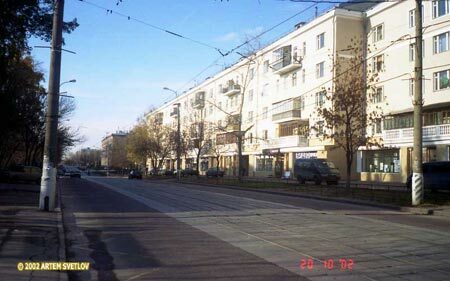 Nagatinskaya Street, connecting Varshavskoye Shosse with Prospekt Andropova, is a typical Moscow road of 1950-60 epoch. There are various bits of building in this street: industrial complexes alternate with residential blocks, green lawns and high trees - with asphalt. 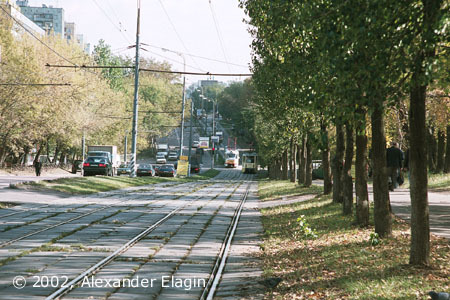 However, tram tracks had been here long before the street came into being, and before this district became a part of Moscow. The line was constructed in 1939-40 to link Varshavskoye Shosse (with an already existed tram line) with wharfs on Moskva River and a new industrial community named Nagatino. The first commuter route to operate here was route K. In the course of time the routes changed, although their configuration had established by the end of 1960s - the line was served by routes 15, 35 and 47. This configuration (excluding route 15 which was cancelled in 1991 because of closure of the line in Avtozavodskiy Most) with provisional alterations exists up to date. 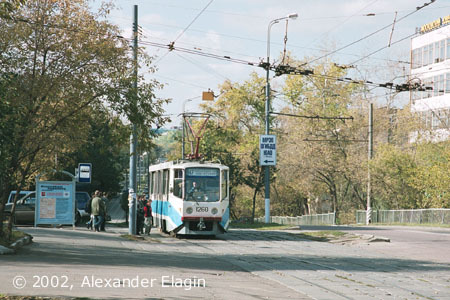 The line begins from a triangle junction at a crossing of Varshavskoye Shosse and Nagatinskaya Street, not far from Nagatinskaya metro station and Nizhniye Kotly railway station. The most part of the line in this street is separated from a road traffic. Nagatinskaya Street follows a bank of Moskva River (which is located a few hundred metres to the north), and the relief is accordingly hilly - like this ravine. A stop with an, err, romantic name Slab factory is located right across the ravine. 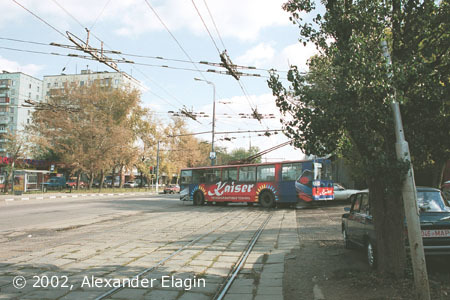 The trolleybus depot #7 is located close to tram tracks in Nagatinskaya Street. 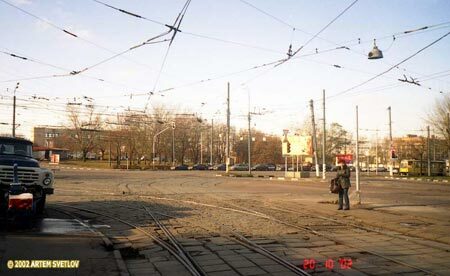 The depot got started in 1964; initially it was planned to host a large fleet of freight trolleybuses (a popular idea of those years) that had to replace a huge number of freight trams that still operated in Moscow. Time has passed, freight trolleybuses could not stand a competition with lorries and completely disappeared from Moscow streets, and currently this depot is one of the largest commuter trolleybus depots of the city. 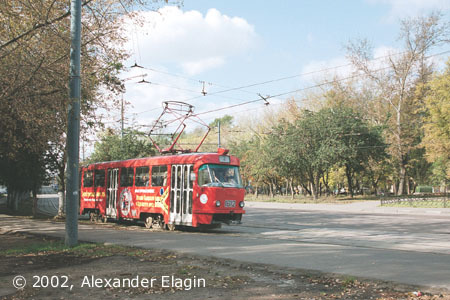 The separated part ends at a crossing of Nagatinskaya Street with Nagatinskiy Boulevard, and the following part of the line up to the very terminus is aligned along the road axis with mixed traffic. The same crossing, viewed eastwards. The next slope, a quite steep and long one, leads to Prospekt Andropova and Kolomenskaya metro station. 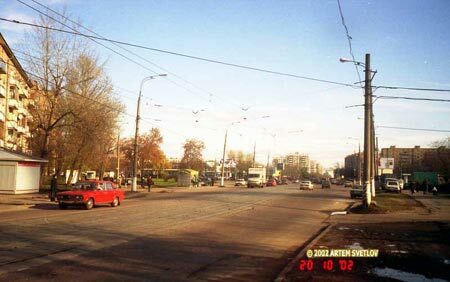 At a crossing with Prospekt Andropova the line slightly deviates from the original alignment. 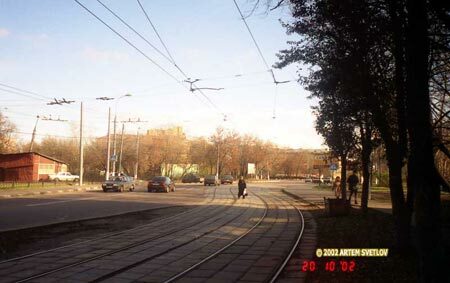 Before 1969, the line followed the street along the building in the left part of the photo; new alignment was caused by construction works on a new (then) metro station and laying of a new highway (Proletarskiy Prospekt, now Prospekt Andropova) - a shorter link from a city centre to the huge new residential zones in the south-east of Moscow.